In late January of this year, I embarked on my biggest journey yet: studying abroad for a semester in Scotland. After months and months of planning, filling out paperwork, and making sure every little detail was taken care of, I was more than ready to hop on a plane and see my new home for the next semester. I was lucky enough to have been accepted to a program in a town outside of Edinburgh; I got a great taste of what it was like to live in a small town while being so close to Scotland’s capitol! I could always find a quiet place to study on the house’s grounds, but I was never too far away from the bustling atmosphere of Edinburgh. It was an excellent balance, and I was ready to see so much of the world I’d never expected to see. Of course, it was more than I could’ve imagined. I spent three months making friends in our house of almost fifty residents, as well as exploring as much of the UK and Europe as I possibly could. I saw everything from the highest mountains of the Highlands to the mighty port of Clydesbank in Glasgow. I wandered along beaches in Barcelona, even visited Rome during Holy Week. Needless to say, I had an amazing adventure. My favorite memory, though, would definitely be our trip to the Scottish Highlands. Having traveled across many mountain ranges in the US, I thought I knew what to expect—but I was wholly unprepared for the sheer beauty of the Highland landscape. 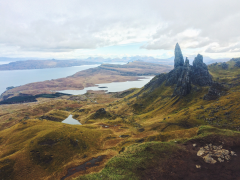 It was honestly hard to believe it was real, even when we were hiking up the Old Man of Storr. Everywhere you looked, you were surrounded by sheer peace and beauty. Sometimes, the mountains disappear into the clouds, a reminder of the vastness of the sky above us. I’d never felt such a sense of peace like I did while exploring the beautiful sights there. Studying abroad for three months is certainly something I never would’ve thought I’d have the guts to do. I’m very much a homebody, so even leaving for college was a tough transition—but I did it. I packed up my suitcase and new travel backpack at the end of January to embark on this fateful voyage. Sadly, now I have to return to the real world. It’s hard to think that, while my life has been going on in Scotland, my family and friends have been moving along in their lives, too. Taking what I’ve learned about myself in Scotland and bringing that home with me, though, will be something I’m sure I’ll be grateful for in the future.